The October 25th Seminar, discussing the latest techniques in cosmetic surgery, will take place at the Heathman Luxury Hotel at 1001 Southwest Broadway at Salmon in Portland. Dr. Michael Workman, one of the most experienced breast augmentation surgeons in Oregon and Washington, is holding a cosmetic surgery seminar in downtown Portland. The October 25th Seminar will take place at the Heathman Luxury Hotel at 1001 Southwest Broadway at Salmon in Portland. Doors are scheduled to open at 5:30 and the seminar will go from 6:00 to 7:30 p.m.
At the end of the seminar, you’ll have the chance to ask questions during a Q&A session, in which Dr. Workman can clear up any misconceptions or rumors you have heard about cosmetic surgery. Attendees who complete a procedure before the end of 2012 will receive 15 percent off their surgical fees. Experience matters when choosing a plastic surgeon. 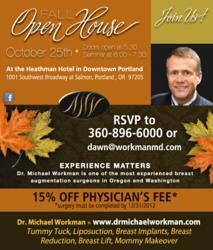 Dr. Workman is one of the most experienced breast augmentation surgeons in Oregon and Washington. He has been board-certified in plastic surgery since 1995. Just last year, Dr. Workman performed more than 400 surgical procedures. With thousands of satisfied patients, you have likely heard about Dr. Workman before. This seminar is your chance to personally meet him and learn firsthand about the cosmetic procedure you’ve always wanted. Register for the seminar today by calling 360-896-6000 or emailing Dawn at dawn (at) workmanmd (dot) com. Board-certified plastic surgeon Michael Workman, M.D. has been practicing in the Portland and Vancouver area since 1993. Together with his friendly staff, he strives to achieve beautiful surgical results in a safe, comfortable environment. As an expert in plastic surgery, he has been asked to appear as a guest on many radio and television programs in the Portland and Vancouver area. Dr. Workman is a member of the American Society of Plastic Surgeons, the American Medical Association, the Clark County Medical Society, the Washington State Medical Association, the Northwest Society of Plastic Surgeons, and the Oregon Society of Plastic Surgeons. In 1986, he attended medical school at the University of Minnesota School of Medicine 1986. He then completed a surgical internship at Oregon Health Sciences University, and a surgical residency at the University of Minnesota. Before starting his private practice in 1993, he performed a fellowship at Case Western.